It’s that time of year again! When tomatoes start ripening, and the basil grows big and bushy. Of course, I’ve killed my basil and I only have one ripe San Marzano thus far, but that isn’t holding me back. My CSA was full of Roma tomatoes and basil this week, and what better to make than the classic combo — tomatoes, basil, fresh mozzarella — a Caprese salad. During summer I eat these every chance I get. Breakfast, snack, lunch, appetizer, between two slices of bread if I need more sustenance. While you could simply throw the three ingredients together and it would taste wonderful, there are a couple of additions that I like to add to take this over the top. Want to know what they are? 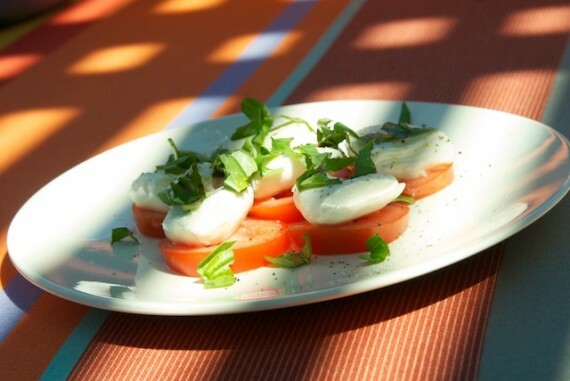 Start by slicing the tomatoes and topping with fresh mozzarella. I’ve used romas, yellow taxi tomatoes, vine-ripened tomatoes — go wild with your selections. Next I like to sprinkle a little sea salt over the cheese-topped tomatoes. Pour a bit in your hand, sprinkle, and toss the rest over your shoulder for good luck. Grind a dash or three of fresh pepper over top. Then add the basil. I like to chiffonade mine and sprinkle over the cheese instead of having whole leaves as some do. To top it all off, a drizzle of quality olive oil. I use a garlic-infused oil to give my salad a nice kick, but any quality oil will do. Tada! Appetizer! Snack! Lunch! You’ve just made something wonderful!